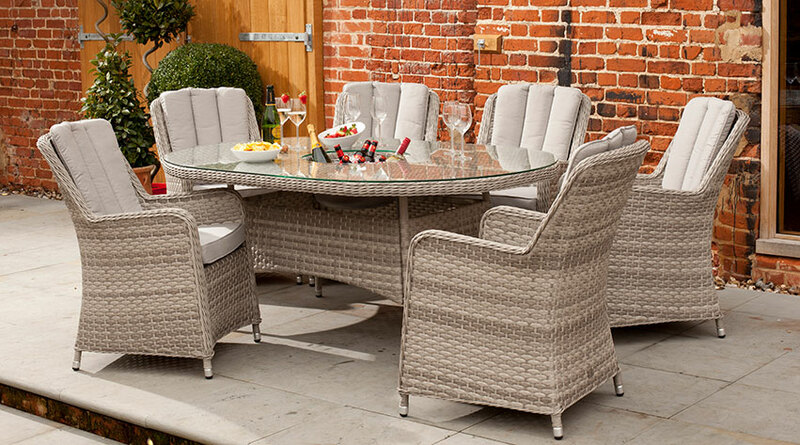 Buying a new piece of garden furniture is an exciting investment into spending more time enjoying your outside space – however you wish to use it. Whether you’re looking for a wooden bench for two or a resin weave suite for eight, there are lots of options to consider. Our furniture buying guide explores the most frequently asked furniture questions to help you get the best from the new addition to your garden. The beauty of gardens is that each one is different and all are unique. When choosing a new piece of furniture it really is all about you and your garden. Start looking for a new piece of furniture by thinking about how you like to use your garden. When do you enjoy your garden? Who uses it? How often? What do you primarily use it for? Answering these questions can help when settling on the type of furniture you buy. For example, if your family of four frequently swells at weekends with visiting grandparents, favourite aunts and friendly neighbours, we recommend choosing a larger 6 or 8 seat suite. That will give you the space to accommodate extra people without having to drag your dining table outside. The extra chairs can easily be removed and put into storage when they’re not required. If you don’t often have sit down meals outside, you may prefer low sofa-style seating to a formal suite arrangement. Some furniture suites allow the opportunity to have both with adjustable tables that can be lowered to coffee table or dinner table height. Again, if you can, it’s good to allow for some additional spaces for guests. You don’t have to buy one piece to accommodate everyone – consider buying some separate loungers or chairs to use when required. The same rule applies to smaller, individual pieces like garden benches. Available in various lengths, benches are wonderfully flexible. Depending on the space you have you can opt for a single long bench, perhaps making the most of a fabulous view, or two shorter benches facing each other – perfect for a late afternoon BBQ. The space, shape and layout of your garden will play a big part in the size of furniture you choose. You might have a small sheltered patio or a large sun dappled lawn. Or perhaps you have a generous decking area which would suit a big dining table or a modest urban balcony that is crying out for a small table set that’s perfect for weekend brunch. When contemplating a new piece of garden furniture we recommend measuring up first. Measure the total area you have to use for your new furniture, then consider how much space you’ll need to ensure you can still comfortably access and enjoy your new furniture. You don’t want to be crammed in like sardines! We recommend allowing a 1m clearance around your furniture – especially if it is a traditional table with surrounding chairs. Gone are the days when wood was your only garden furniture option. Now, alongside beautiful eucalyptus, teak, roble and mahogany, garden furniture is widely available in modern metals and resin weave. Which is right for your garden? We love how unique wooden furniture is – you’ll never find another piece the same as yours. All have truly different colourings and markings. Tropical hard woods like teak, roble and eucalyptus have a high natural oil content, making them naturally water resistant. Garden furniture made of these woods can be left outside to weather naturally – they’ll develop a lovely silver grey colour. Exposure to wind, rain and sun will cause the wood to develop small cracks along the grain. This is perfectly natural, but to prolong the life of your wooden garden furniture we recommend investing in some furniture covers to use during the harsher winter months. Wood furniture is also wonderfully adaptable. Fancy a new look in your garden? No problem – you can add new cushions or perhaps – if you have a spare weekend – a good sanding and new lick of paint in the latest shade of colour will give your furniture a new lease of life. We love the modern coolness metal brings to a garden. Available in an array of shapes, sizes and colours, metal complements any patio, lawn, decking or balcony, no matter the size. Metal furniture is given a good coating of anti-rust treatment so it can be enjoyed whatever the weather. Aluminium furniture is especially popular – it is rain resistant and sturdy, yet still lightweight enough to move around the garden. Some sets and suites even come with shower resistant cushions! Cast aluminium construction on these suites means no rusting, while the stainless steel fixings ensures your furniture can be left outside all year round making them virtually maintenance free. Looking for a smaller, foldable piece of furniture? These are perfect for offering extra seating at the drop of a hat. They are ideal for popping out on a sunny day in the garden or taking with you to picnics and beach trips. Lightweight and portable, these foldout pieces are easy moved and best stored away when not in use. Resin weave is the newest material for your garden furniture, as well as being hugely popular. We love the soft lines, ultimate comfort and irresistible warmth you get from resin weave garden furniture. Resin weave is perfect for formal dining as well as more relaxed sofa sets and loungers. A modern twist on traditional wicker, resin weave is much hardier, providing a material that is weather-resistant, tear-resistant and supple. Happy in both hot and cold temperatures, resin weave can be left outside year-round. Available in light caramel, soft grey and rich chocolate tones, there’s a resin weave option to suit all gardens. Resin weave garden furniture is often better suited to slightly larger spaces as these pieces tend to be larger. How you store your garden furniture really depends on the material it is made from. While wood, metal and resin weave furniture is weather resistant, it’ll stay looking its very best for longer if you protect it during periods of cold, wet or unusually adverse weather. For larger sets that are not easy to move, we would recommend investing in furniture covers. These can be easily thrown over your set to protect it from the worst of the rain and snow. Before doing this, remove soft accessories like parasols and cushions and store them inside or in a shed or garage. Remember to ensure that your furniture is dry before covering to avoid mould forming or rot setting in. For smaller pieces, like chairs, loungers and foldable sets these are best stored in a shed or garage when not in use. Whatever piece you choose, care and upkeep are important to ensure the longevity of your furniture. Check out our care guide for top tips, instructions and advice.